Background: Why we need QoS ? In LTE Network QoS is implemented between UE and PDN Gateway and is applied to a set of bearers. 'Bearer' is basically a virtual concept and is a set of network configuration to provide special treatment to set of traffic e.g. VoIP packets are prioritized by network compared to web browser traffic. 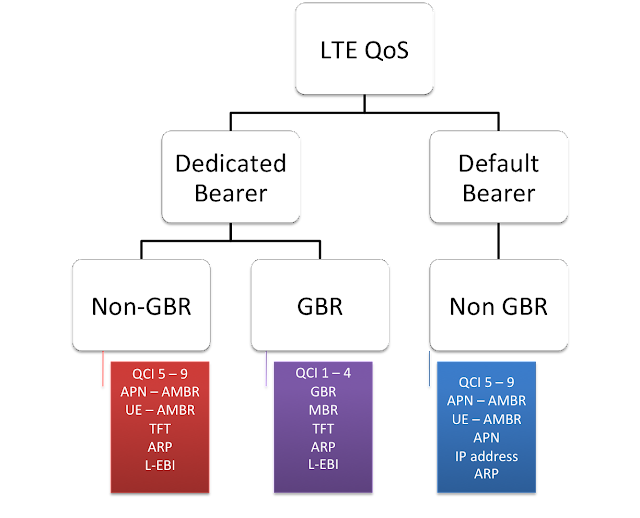 In LTE, QoS is applied on Radio bearer, S1 bearer and S5/S8 bearer, collectively called as EPS bearer as shown in figure below. In order to comprehend the concept of QoS , we must understand the bearer types and properties associated with each bearer through hierarchical chart as shown below. First there are two types of Bearer, i.e. Dedicated bearer and Default bearer. There is at-least one default bearer established when UE is attached to LTE network while dedicated bearer is always established when there is need to provide QoS to specific service (like VoIP, video etc). Please go through the article Default and Dedicated Bearer which hopefully will help to explain the concept in more detail. Dedicated bearer can be subdivided into Non-GBR and GBR types. - ARP: Allocation and retention priority is basically used for deciding whether new bearer modification or establishment request should be accepted considering the current resource situation. - TFT: Traffic flow template is always associated with dedicated bearer and while default bearer may or may not have TFT. As mentioned earlier, dedicated bearer provides QoS to special service or application and TFT defines rules so that UE and Network knows which IP packet should be sent on particular dedicated bearer. It usually has rules on the basis of IP packet destination/source or protocol used. L-EBI: It stands for Linked EPS bearer ID. As I discussed in previous article about dedicated and default bearer, we know that each dedicated bearer is always linked to one of default bearers. L-EBI tells Dedicated bearer which default bearer it is attached to. Is APN-AMBR "APN Aggregate maximum bit rate is the maximum allowed total non-GBR throughput to specific APN" described per UE? How do the GBR and MBR measured? Some documents said that it is defined as "the number of bits sent during a period / the duration of the period". How long is the period? It is a given parameter to eNB, for example as kbps (kilobits per second) on end user layer. For the QCI1 for VoLTE it is usually around 30-50 kbps per UE. I want information in LTE(4G),can you please explain about Agilent T4110S, PIXIT and PICS configuration and uses. Hi , I want to do research on QoS in LTE network. Can anyone suggest me which simulator will be easy for this? A nice article indeed. Thanks for sharing. Informative post. I am happy that I found your post while searching for awesome news and idea. Thanks! It is very useful and interesting website. I also want to recommend one another Expert in this field at New York who provide the Cisco Training Course with advanced module . It is a bit complicated with me to understand but however I like your articles, thanks for give sharing this to all together. I thinks its very effective & important post i want to more information. When UE attaches to LTE-Network, a default EPS-bearer is created. Suppose the User wants to make a VoLTE call, so QCI=1 and a dedicated EPS-bearer will be created and this dedicated EPS-bearer will be attached to default EPS bearer created before. Now the User wants to play Real Time Gaming, its QCI=3, so another dedicated EPS-bearer needs to be created. My questions is, which default EPS-bearer this new dedicated EPS bearer will be attached ? Does UE know GBR/MBR limit? Are these values communicated to UE during dedicated bearer creation? 1. Establish Default Bearer "AMBR = 3 Mbps". 2. Establish Dedicated bearer with following characteristics "UL MBR = UL GBR = 1 Mbps". 3. Pump UL data 10 Mbps on both bearers. My scheduler gives grants in the form of DCI0 for both bearers. Even my scheduler is giving grants for default bearer but UE is sending data for dedicated bearer. Is this issue with UE? or some other mechanism need to be implemented to prevent such case.? Good Article.. Thanks a lot!!! Really useful and informative webpage. Very useful post with lots of information. This is very important to know.Thanks a lot for sharing.regards,Call Center Jobs for Fresher’s in Hyderabad. Cricket’s main selling point when it comes to their wireless data services is their high area coverage, especially since they were acquired by AT&T and continue to operate with the addition of the telecom giant’s wide-reaching network. Cricket is a small player, but their offering of an unlimited internet plan, Cricket APN settings | Cricket Wireless APN Settings for Android & iPhone, riding on their coverage asset, makes it very attractive to many consumers. This is really great stuff. Simply I am enjoyed. Thank you. Cari Agen PokerOnline Berbonus Deposit? Am really grateful and thankful for what Dr.Onokun has done for me and my family. I Was having HIV/ AIDS for good three years with no solution, the diseases almost took my life and because I was unable to work and I was also losing lots of money for medication, but one faithful day when I went online, I met lots of testimonies about this great man so I decided to give it a try and to God be the glory he did it. he cured me of my diseases and am so happy and so pleased to Write about him today. if you need his help or you also want to get cured just the way I got mine, just email him below and get your healing. please get in touch with this (Dronokunherbalcure@gmail.com) or whatsapp him +2349064844957 . Thank you, Dr. onokun for such a blessed creation. May God allow your legacy to live on. Your products could heal the world.